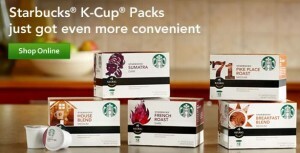 Order Starbucks K-Cups - Who Said Nothing in Life is Free? Looking for some K-Cup® Packs for that new Keurig® Single Cup Brewer? Finally, the taste you love from Starbucks is now available online in K-Cup® Packs. In each cup you will find 40 years of coffee sourcing and roasting expertise. Bring the aroma, body and rich flavor of Starbucks coffee right to your door. **I got Kevin a Keurig machine for Christmas (the Plum Ditrict daily deal) so I may need to stock up on Starbucks K-cups to take with me when I go over to his place!!! I’m sure you know this but there was a coupon for the Starbucks K-Cups in one of the ads recently. It was for $1.50 off.